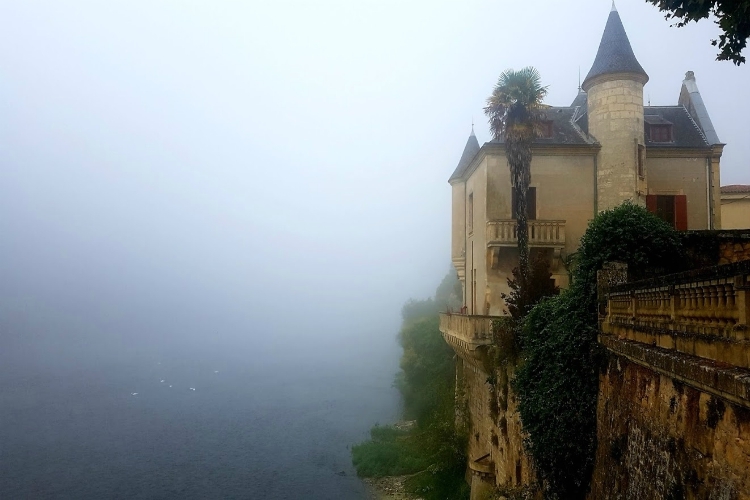 With the eponymous river running through its heart, the Dordogne really is a treasure trove when it comes to the hidden beauty of France. It’s got history, culture and tasty cuisine in spades, and the landscapes offer breathtaking views and exciting activities in equal measures. 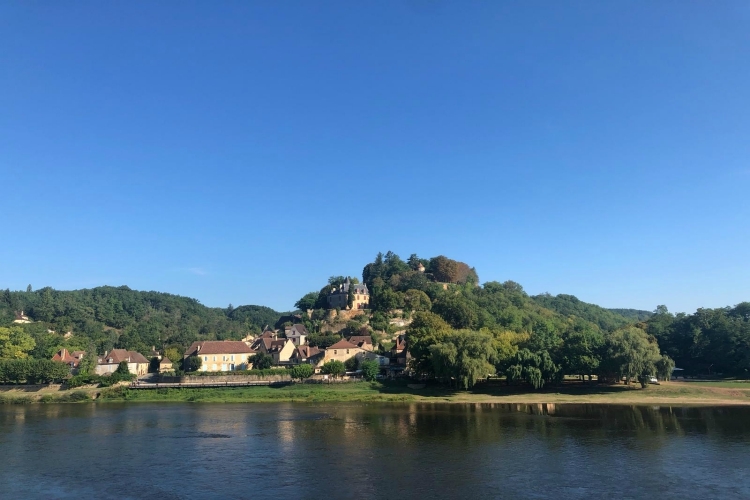 Our marketing team recently spent 48 hours exploring the Dordogne region and have put pen to paper (fingers to keyboard) to tell you all about it. 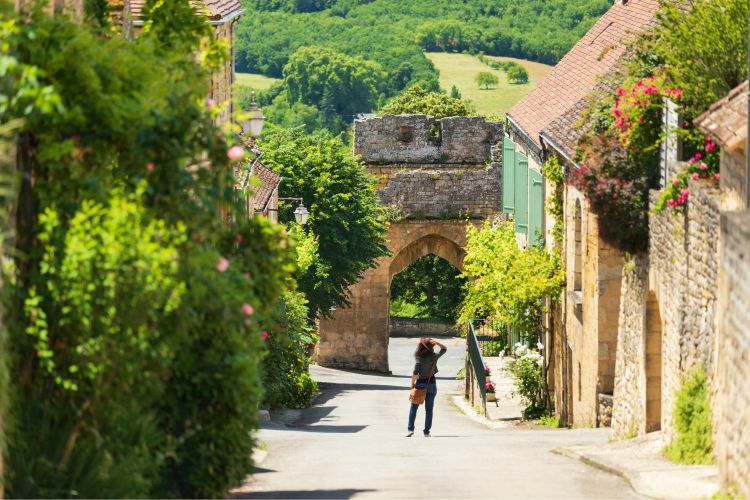 From things to do, what to eat, villages to visit, the best family activities and where to stay – pour yourself a glass of fine wine (or tipple of choice) and dive into their in-depth guide to the Dordogne. Hey, I’m Margo! 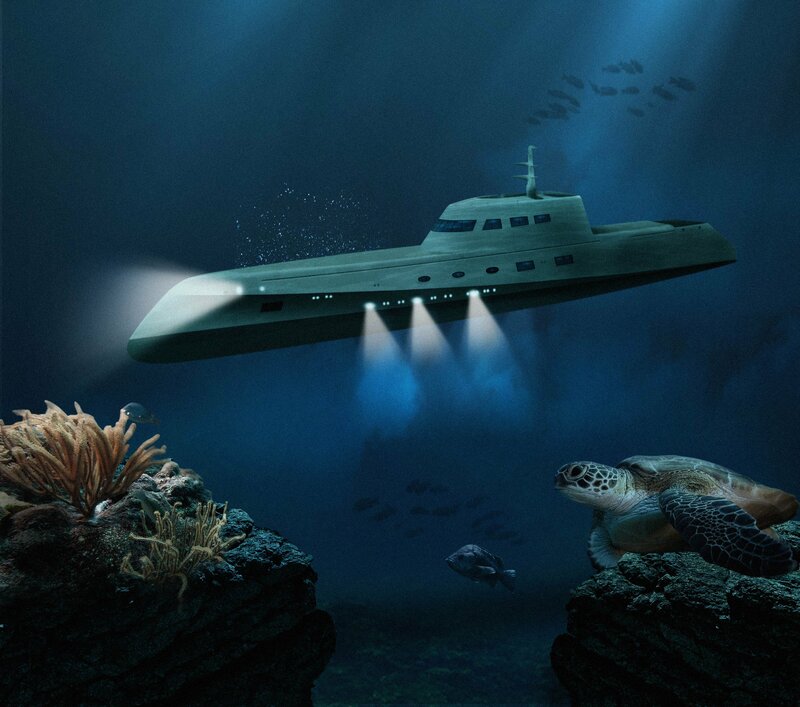 I am always on the lookout for out of the ordinary experiences and anything fun to do! I love ‘living like a local’ and for me the essence of travelling is finding experiences that are specific to the place I am visiting – and you’re in luck here, because the Dordogne has to be one of the most versatile regions in France with stuff to do for pretty much everyone (bar the party animals, I guess). Sure, the Dordogne has it all: history and beautiful castles for culture vultures and history buffs. Lovely weather, lush landscapes and stunning rivers for the outdoorsy type. Hearty duck, refined truffle, creamy cabecou (goats’ cheese), underrated wines and colourful markets for the foodies… But, if like me you’ve spent a good chunk of the last ten years visiting family in the Dordogne year-in-year-out, chances are you could become a little bit blasé about the beautiful region! So, I have selected my favourite activities and experiences in the Dordogne to make sure you never get bored of it! The Dordogne region is the perfect playground for all sorts of creative activities, whether you like painting landscapes, learning about the art of glassblowing or fish leather creations (it’s a thing! ), the atmosphere and beautiful surroundings will get your creative juices flowing! Spend the day snapping stunning sceneries and discovering the Dordogne through your lens with professional landscape photographer – Gareth Kirkland. The day will start early as you will be shooting at dawn but if you feel the need to go over the basics beforehand, you can arrange to meet Gareth at his gallery the night before to prep the unforgettable day ahead. Just don’t forget your camera! Same idea just different tools; instead of snapping your way around the Dordogne, this workshop allows you to paint the beautiful landscapes surrounding you. You also don’t need to be Picasso to take part, as long as you are interested, eager to learn and to enjoy your day – you are more than welcome to join. A vos pinceaux! Spend a couple of hours with Delphine, an artist from the region to design and create your own enamel jewellery. You’ll get to leave with your (hopefully) beautiful creation at the end of it, which is a much better souvenir of the Dordogne than the usual fridge magnet! South West France is generally heaven for outdoorsy and sporty people: the ocean, the mountains, the scenic roads… the Dordogne is no different (well, after swapping the ocean for the rivers) and has a lot to offer whether you want to kayak on the river, cycle through the lush countryside or even just walk. There is something for the whole family, here: you can go on an adventure high above the ground through a treetop adventure course, you can climb trees, free jump, play minigolf and even cool off in the eco-friendly swimming pool. 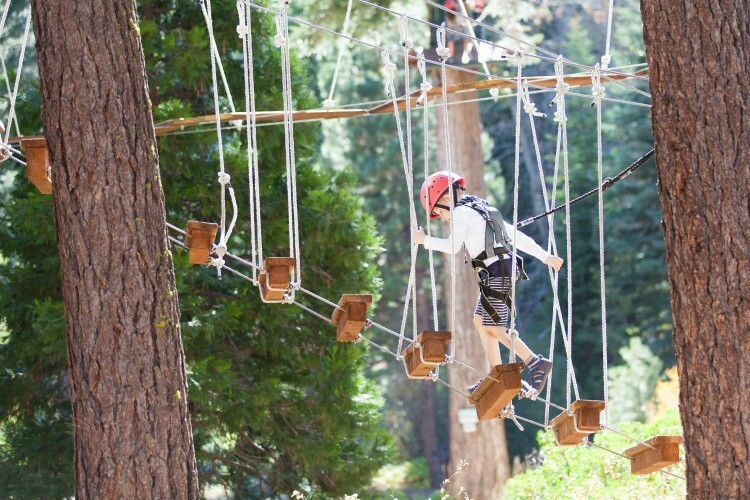 Parc en Ciel is the perfect day out for groups and families who enjoy the outdoors and a spot of adrenaline. 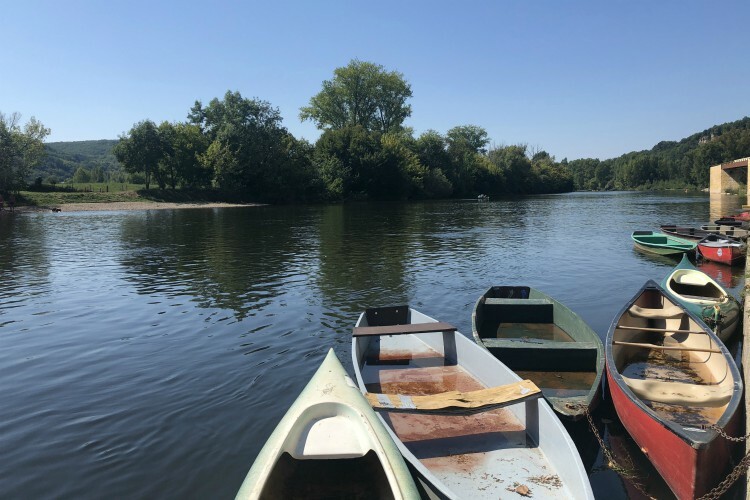 If you aren’t so keen on jumping from tree to tree all afternoon, you can discover the Dordogne region from its main attraction: the river by embarking on a gabarre (a flat-bottomed boat) to take in the beauty surrounding you. From the river, you will have a unique view of the beautiful villages like Beynac and Domme and enjoy the tranquillity of drifting slowly along the Dordogne river. This must be the most breath-taking way to visit the region – that is if you are not afraid of heights! During your time in the hot air balloon whether you choose to do it during the day or at dawn, you will get to see the beautiful Dordogne from above. And looking at all the raving reviews it’s definitely a once in a lifetime experience! The Dordogne is a foodie’s paradise; its gastronomy is rich (literally) and hearty. From truffles and cheeses to wine, duck in all forms and walnuts – the region is full of specialities that are all worth sampling! Spend a few hours learning how to cultivate truffles, before hunting for them with dogs, you will feel like you are panning for black gold! Once back from the hunting you will take a class on how to cook with truffles and even taste the dishes! You can’t go to the Dordogne without tasting the truffles. The Bergerac region might not have the same status when it comes to wine-making as its neighbouring Bordeaux region, but the winemakers have nothing to be shy about: you can try beautiful Monbazillac and Pecharmant in many chateaux and wineries; but if you want a more immersive experience follow Christophe for a couple of hours in his wine property (that’s technically not in the Dordogne) and learn how to make wine, participate in making it and obviously finish your experience with a bit of tasting too – in moderation of course! If wine is not your thing (I may judge you a bit), you could instead opt for learning how beer is brewed and bottled with Denise and Hugh, so that you don’t feel too homesick! Le Chevrefeuille organises cooking classes and market tours, to help you discover the gastronomy of the Dordogne. You can do it solo, as a group or as a family and the best thing is that you obviously get to eat what you’ve cooked, so that’s a good incentive not to burn your duck! With its 200 animals originating from around the world this ecological reserve is no ordinary zoo. Here most animals are roaming freely, and you can get up close and personal with lemurs, wallabies and all sorts of monkeys. 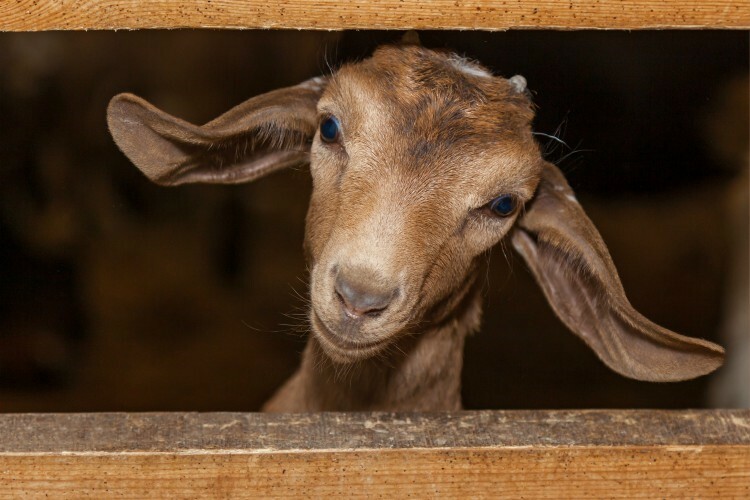 Visit a goats milk farm to learn about the process of making cheese, and maybe even participate in feeding or milking the goats. If you visit in February you might even get a chance to witness the birth of baby goats. You can walk freely around the farm and also buy a picnic lunch with the farm’s own produce. As you go through this 5-hectare park, you will walk into your ancestors’ steps and understand how life was during our prehistorical beginnings. A lot of explanations and exhibitions along the path make the visit both educational and fun, and the kids can even take part in workshops and activities. Price: €7.50 per adult, €6.50 for students and €4.50 kids aged 5-13. €3 for workshop and activities. As a last piece of advice: if you are interested in witnessing local life and traditional gatherings then head to the Dordogne during the sunnier months but do a bit of research prior. 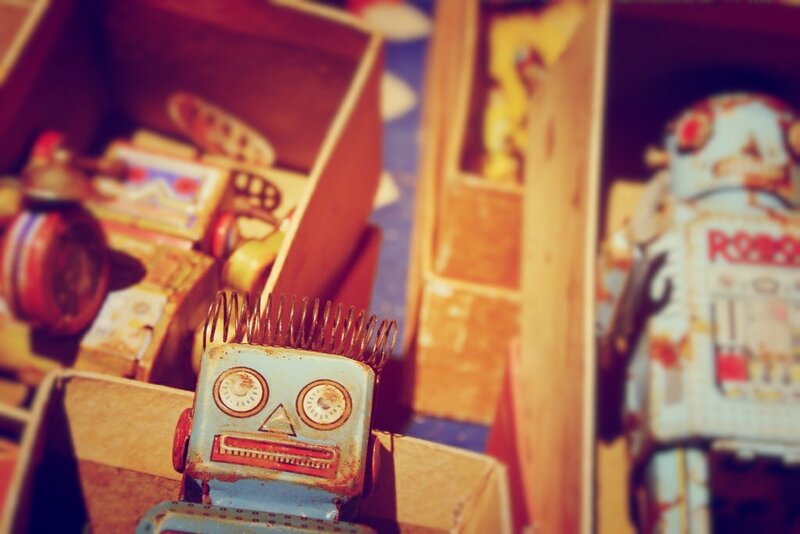 Chances are there may well be a village fete, food festival or something similar on. 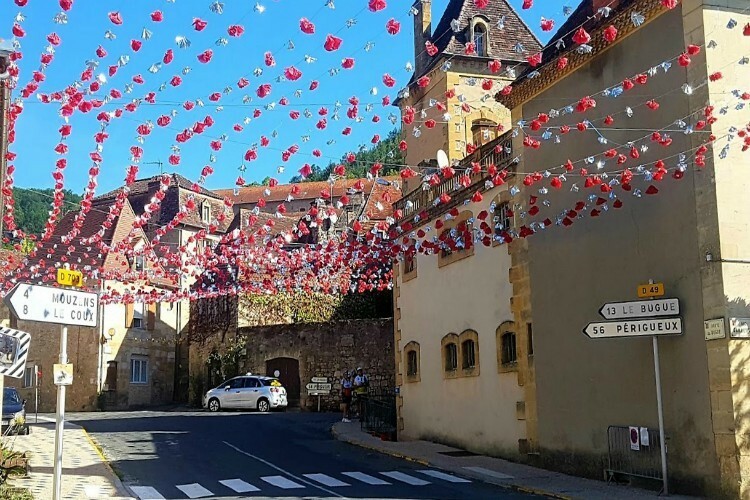 Like the 99th Felibree festival we stumbled across in Saint-Cyprien; 400,000 flowers were made by villagers to decorate the streets of Saint-Cyprien to welcome visitors for 3 days. Magical! Hello, I’m Maria, Marketing Manager at Oliver’s Travels. As a mother of two boys, I’m always on the lookout for new kid-friendly destinations where there’s enough for both kids and parents to have a great holiday. 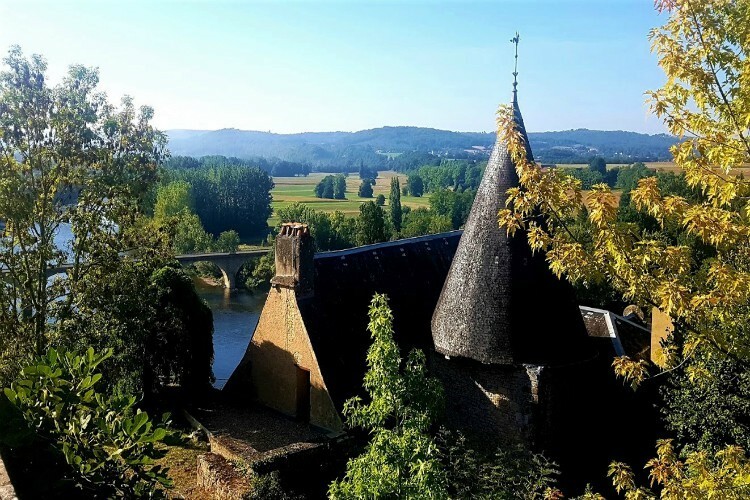 The Dordogne certainly ticked all those boxes – and then some! As soon as you arrive in the Dordogne you quickly understand the appeal. One of the areas in France with the most UK expats whilst virtually unknown to the rest of the world, is one of our best-kept secrets. The mild(ish) weather, historical sites, picture perfect towns and dozens of fun outdoor activities make this region an ideal family destination. ?? It’s a short (and inexpensive) flight – 1hr 45min from London with budget airlines offering return flights between £50-£100. ?? The mild weather and long season mean you are just as good to travel in the May or October half-term and still be in the 20C’s. ?? From the moment you arrive at Bergerac everything is easy and straightforward – the airport, the car hire, the roads, grocery shopping and the organising your to-dos. These are usually within easy reach so no matter where you are based, you are sure to find lots to do at less than an hour away. ?? The people, culture, history, and village life… everything is a joy to experience, and you really are absorbed by the tranquil French way of life. It makes the whole holiday feel more real and off the beaten track for the whole family – certainly trumps a theme park! ?? The language. With so many UK expats and tourists you are likely to find lots of locals speaking English – and if they don’t – they will certainly put in the effort to make you feel welcome anyway. ?? The places to stay! From big chateaux to small gites – staying in a French villa gives you a flavour of the authentic Dordogne. ?️ Kayaking or canoeing down the river is probably my favourite one. You board at Vitrac or Carsac and get to enjoy the slow drift down the river until you get to Beynac, enjoying some of the most stunning views along the way. You can stop for a picnic at one of the natural beaches or in one of the lovely terraces overlooking the river. Dreamy! ?️ Visit the famous chateaux of course! 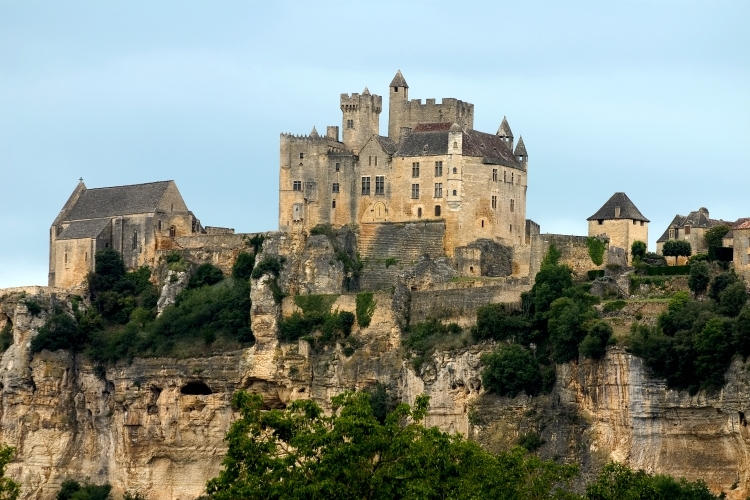 Castelnaud Fortress and Beynac Fortress are probably the best. Castelnaud has plenty of guided theme tours and medieval demonstrations that the young ones will love. But the best for kids is probably Chateau de Bridoire which has vintage indoor and outdoor games, animals and good food –the perfect fun day out for the whole family. 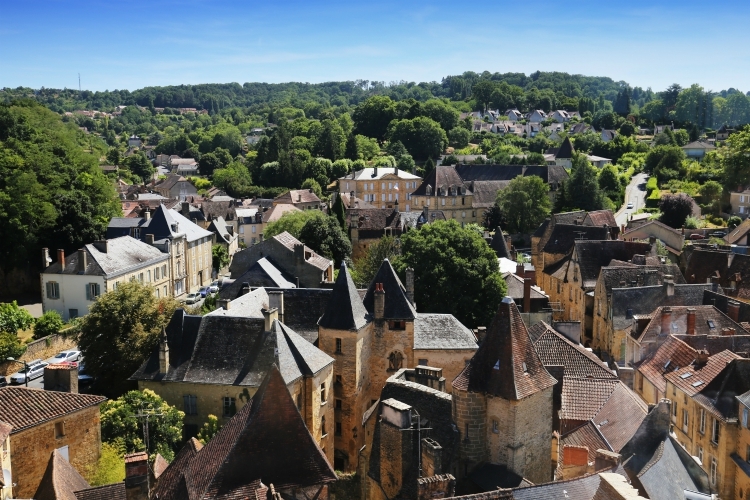 ?️ Walk the medieval villages – Busy Sarlat, riverside La Roque Gageac and hilltop Domme with it’s small train ride are some of the highlights for kids. For an even more immersive experience, don’t miss the Village du Bournat in Le Bugue – where you can enjoy a normal day if the year was 1900! Lots of activities for the kids, including funfair rides, in this well-constructed theme park. ?️ Visiting one of the famous caves! My cave highlights include Lascaux (probably the biggest attraction in the Dordogne! ), the Gouffres de Proumeyssac and Padirac as well as the cave dwellings of La Roque St Christophe and Roc de Cazelle. For prehistoric parks – there’s Tursac, Le Thot (near the Lascaux Caves) – or the Dinosaur Park in Saint-Léon-sur-Vézère. ?️ The Dordogne has adventure activities by the dozens! From water parks and horse riding to rope courses and bike tours, the region has them all in abundance. Just ask when you arrive for the nearest to you. Univerland in Le Bugue has jungle golf, big bird high ropes course, and an aquarium, so you can get plenty done all in one day. 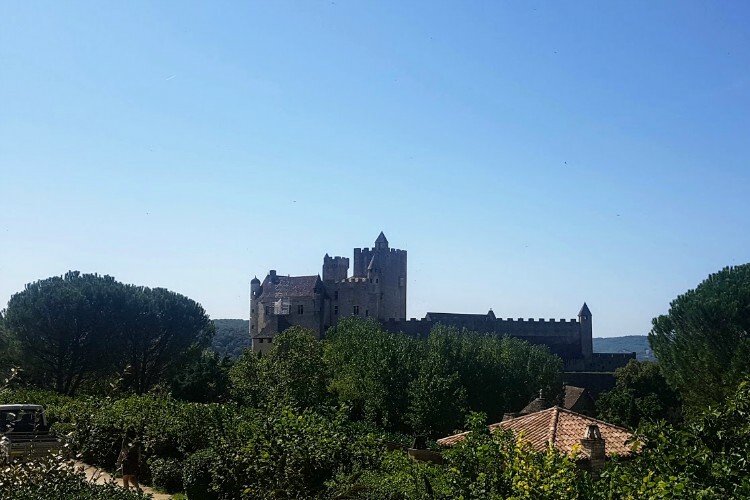 Finally, I highly recommend getting a private tour at least for a day, that way you can get driven to the different attractions whilst also learning all about the region’s history, its chateaux and villages. You can do this when you first arrive so you get a flavour of the area. I highly recommend Christoph from Taxi “A la carte” who between him and his wife can fit up to 13 in their modern & comfy cars! Delectable, delicious, decorous duck in the Dordogne. ‘Scuse the OTT alliteration however it seems rather fitting for our brief stopover in this mighty duck-celebrated region. I’m Natasja, Marketing Communications Manager here at Oliver’s Travels and also one of many resident foodies in our office. Naturally, I was quick to volunteer to write the food and wine segment of our whirlwind trip. Chances are if you’re familiar with the Dordogne you’ve probably also heard of some of the prominent ingredients that make up the distinguished dishes in the region. You’ve of course got the famed duck (have I mentioned that yet? ), along with the most remarkable black truffles, ceps and walnuts which are all grown locally. Then you’ve got the sharp, yet incredibly oozy Cabecou (aka Rocamadour); a super soft goats’ cheese on complete opposite spectrums to the crumbly stuff we get here in the UK. And let’s not forget the lip-smacking wine! Although under shadowed by its popular sister Bordeaux, grapes are harvested in abundance in the Bergerac region and if you ask any local, they will proudly boast of their nutrient-rich land stretching alongside the river, which produces a wide range of appellations including the most well-known – Monbazillac sweet wine. Now, that’s enough of the stuff you probably already knew, let me (hopefully) whet your appetite with my gastronomic highlights of our trip. After dropping off our bags at our villa, we were picked up by the lovely Marie-Paule, of 2bwinenot.com, our wine tour guide for the afternoon. Off we headed in her comfy 4WD to the super quaint, tiny village of Monbazillac. Along the way, Marie-Paule imparted some of her vast knowledge of the Bergerac and Bordeaux winemaking regions, and before long we arrived at our first thirst-quenching stop. 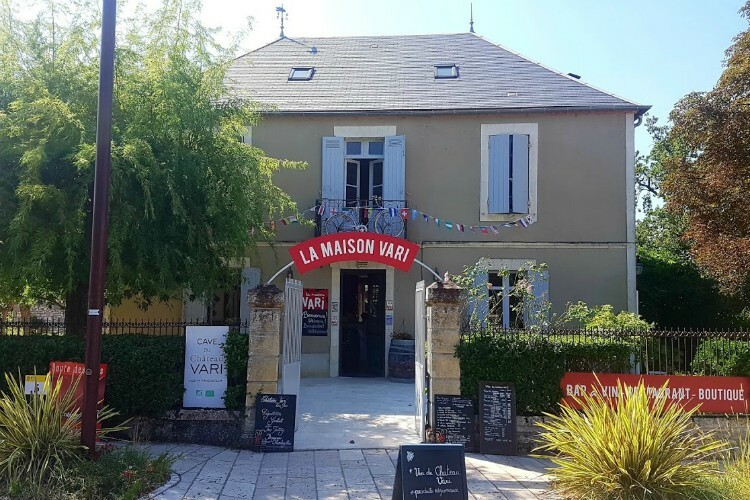 La Maison Vari is an utterly charming wine bar/café/shop located right in the middle of the village square. They offer workshop tastings, a winemaker’s cellar as well as fresh, seasonal meals in their restaurant or out in their delightful courtyard. We learnt from the very friendly owners that their chateau winery is actually located a couple of kilometres further along the road however after years of missing out on visitors due to tourists stopping off at other wineries before reaching theirs, they decided to set up their shop right in the square and bring the wine-tasting experience to their cafe. Lucky for us we got to try it all out…With the sun beaming down, al fresco was the only way to go, and so we plonked our tired bodies down to enjoy a super tasty lunch amongst pretty vine pergolas which provided just enough shade in the warm September sun. For our meal we were served a scrumptious antipasto type platter which included; duck rillette, a selection of cold cured meats, a couscous salad and a couple of cheeses – Rocamadour and a hard mountain cheese served alongside plenty of crusty baguette and butter. Together with the meal, we sampled tastings of their rose, white, red, finishing with the star of the show – the famous Monbazillac. Unlike the typical syrupy dessert wines, it was still semi-sweet on the palate yet both delicate and fresh. Needless to say, it went down a treat with our dessert trio of tart raspberry sorbet, a beignet (a sort of hybrid between choux pastry and a doughnut) as well as a madeleine. Joined by a strong double espresso to perk us up, we set off, belly’s full and thirst replenished. 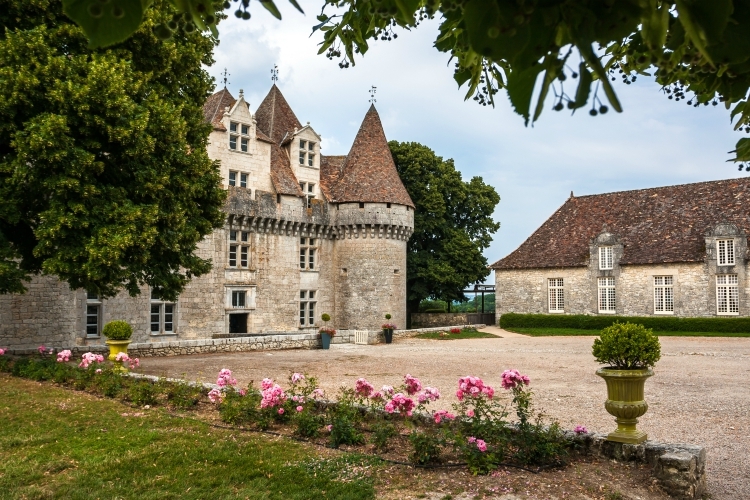 A short trip down the road we squeezed in a quick stop off for the ‘gram to the impressive Château de Monbazillac. Here we took in the most incredible valley views before setting off towards Chateau de Panisseau. Here we were shown around the estate by the knowledgeable manager, Emmanuel, and his sidekick Ioda, a sprightly Jack Russell. 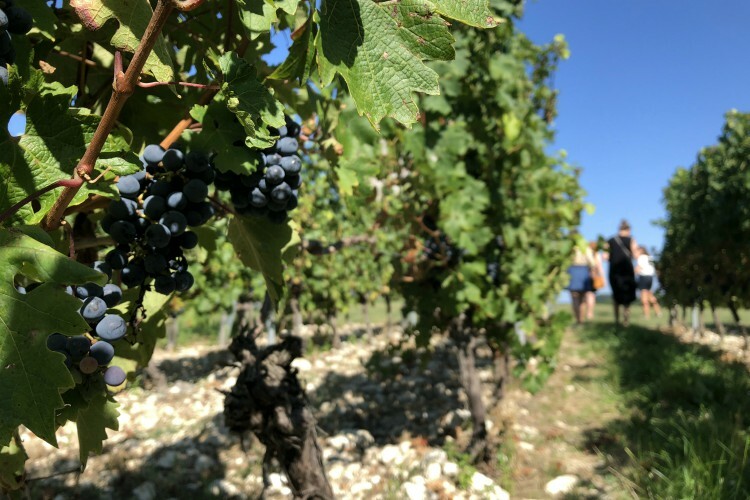 We were led on an informative tour of the vineyard, learning about the varieties of grapes they harvest and shown around the factory, whilst the workers were busy getting everything ready for the looming busy harvest season. 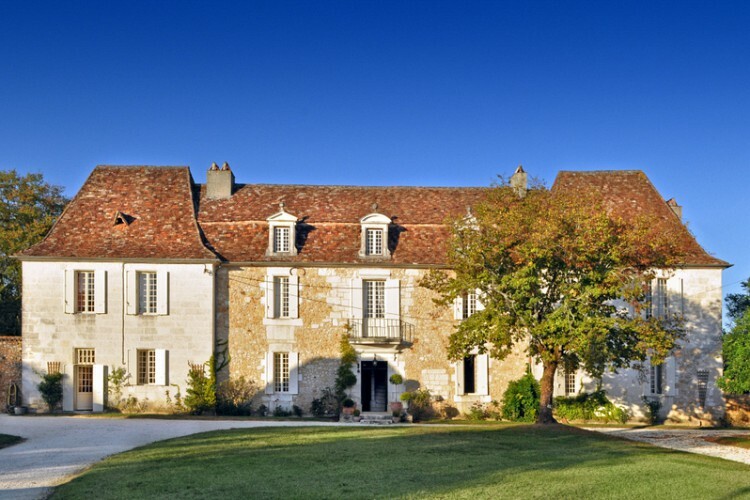 For just €7 at Chateau de Panisseau, you can enjoy a generous tasting of a variety of their wines. We were so impressed that we decided to ship a crate back (each of us picking our favourite tipple) along with of course a crate of the mouth-watering Monbazillac wine we’d purchased from La Maison Vari earlier. Although feeling rather sleepy (and perhaps a little tipsy) we were sad to say goodbye to our new friend Marie-Paule. Marie-Paule offers private, half day or full-day, bespoke wine tours for couples or groups in both Bergerac and Bordeaux. We can’t recommend her highly enough! That evening the generous Le Chai owner, Christine kindly hosted us in her house, adjacent to our villa, where she had prepared for us a gorgeous authentic banquet. Starting with a chilled Monbazillac aperitif we munched on breadsticks and aubergine dip while chatting away about our first day. We then got stuck into a beautiful tomato tarte tatin dish. The slow-roasted cherry tomatoes were caramelised and sticky yet slightly acidic providing a harmonious contrast with the crisp, buttery pastry beneath. For our main, we were treated to a Dordogne speciality; magret de canard. The perfectly pink, plump duck breast was served together with a melt in the mouth ratatouille. Although I love the rich, distinctive taste of duck, I have to admit I do prefer the less ‘gamey’ flavour accomplished when you slow roast or confit the duck. Luckily for moi, we were fortunate to also sample my preferred version, confit de canard, on our second night – more of that shortly. Just in case we thought we hadn’t quite reached our wine quota for the day, we were then served a poached pear in a lightly spiced, Monbazillac wine. It was the perfect finisher to our wonderful yet exhausting first day. After a busy morning visiting Sarlat, Beynac Castle and the other beautiful villages Susanna will touch upon next, we headed off to Chateau de Neveu for what was to be my foodie highlight of our trip. After hearing so many fantastic reviews from our customers, of our catering partners, Dineindulge, we decided to try them out ourselves and booked a private chef experience for the evening. And oh boy, they certainly did not disappoint. Our chef for the evening was Céline Issitt, who also runs a food truck pop-up, Toast, based near Bordeaux. In addition to the five-course feast we had in store, we started off the evening filming Céline for our Youtube channel (watch this space), so you too can try some authentic regional perigourdine recipes yourself. 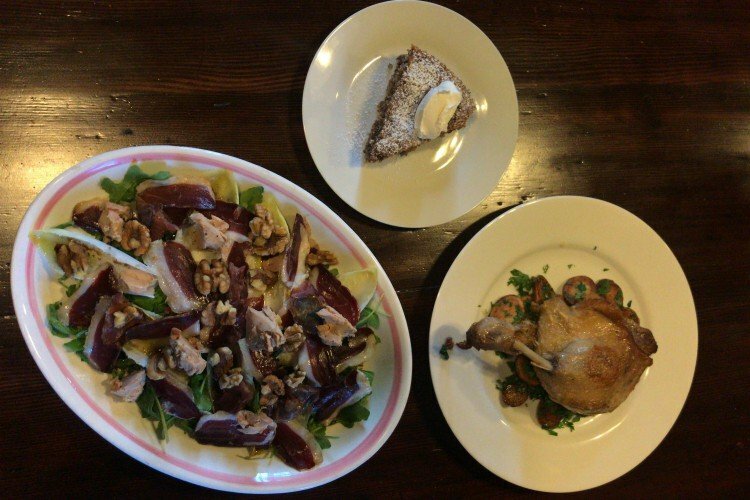 The video recipes started with a Perigourdine salad; crunchy endives laden with smoked duck breast, foie gras, gizzards and walnuts drizzled with a tart mustard vinaigrette. Next up was my personal favourite: confit de canard, a succulent, rich and crispy confit leg of duck served alongside tremendously punchy, garlicky potatoes with fistfuls of parsley. The final video we filmed was for a super simple walnut cake, that even lazy bakers, like myself, could whip up in no time. As we had already pigged out on the rich, meaty dishes from the video, we decided to join our vegan colleague, Susanna, for the rest of our dinner and were treated to an incredible, guilt-free feast. Starting off, a refreshing amuse bouche of cucumber and parsley gazpacho, followed by a wonderfully flavoursome mushroom pate, with homemade fig pearls, pickled fennel and a basket of brioche and walnut bread. Main was a fabulous truffle and mushroom risotto – wow-wee this was an earthy, unctuous stunner of a dish! Next was a mixed cheese platter of Roquefort, a Pave D’Affinois (a soft double-cream cow’s milk cheese, similar to brie) and of course some more local Rocamadour (Cabecou). This was served alongside Céline’s homemade crunchy piccalilli which she had fallen in love with when she had previously lived in England. To end the meal she’d prepared some lovely poached pears however us non-vegans decided to devour the walnut cake with a generous dollop of crème fraîche. What a meal to round out the final evening of our trip. You can book Dineindulge for a special occasion meal at home or while on holiday in the UK, France and Spain. Easy to book, excellent chefs and incredible restaurant-quality food, I wouldn’t hesitate in recommending them. 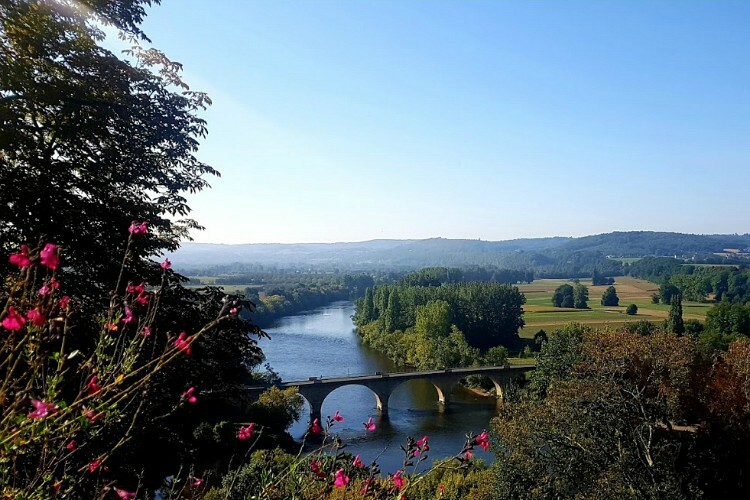 Taking you along on our visits to some of the most beautiful villages in the Dordogne is me, Susanna, Oliver’s Travels’ very own Marketing Assistant. This was my first ever trip to France and I was beyond impressed by all the places we got to see. I hope you like the sound of them too! But as the sun breaks through in the skies we understand that Lalinde isn’t a ghost town at all. Rather, it is a countryside hub of local culture and tradition right on the riverbank. This is the oldest fortified town in the Dordogne, and a sense of history is ingrained in its colombage walls. Wine shops neighbour bookstores and the public garden by the water seems the perfect place to bring both a glass and a novel. As midday approaches the streets fill with locals and visitors alike, making us feel welcome in such a charming place. 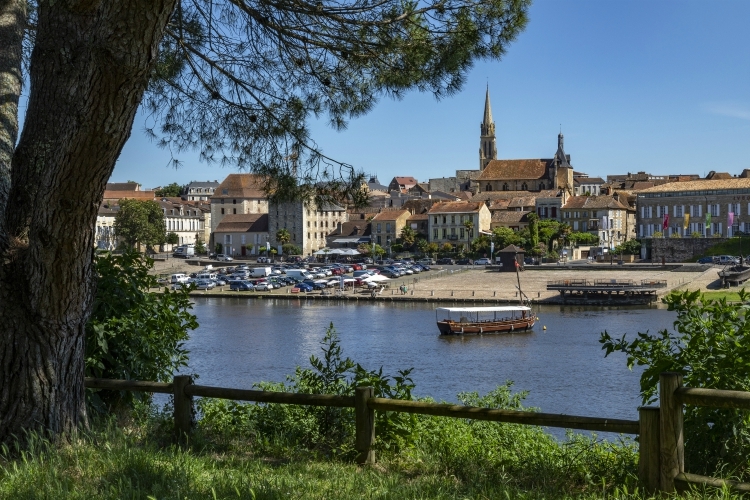 At the meeting point of two ancient rivers (the Dordogne and the Vezere), we encounter Limeuil from across the water. Its stone walls climb up the hill creating a maze-like spiral of streets and alleyways which we explore enthusiastically until they bring us to the panoramic gardens at the very top. It’s a colourful place with a unique feeling of magic that we’ll come across another handful of times during our trip. We rest there for a moment and breathe in the fragrant air before making our cobblestoned way back to the river’s beach and the foot of the town. Limeuil feels like the perfect introduction to the villages of the Dordogne. It has a sleepy atmosphere, but a few happy locals eating breakfast at a riverside café gave it a spark of life. Its history is palpable, but so are its touches of modernity. We’re especially intrigued by the series of street art that decorate the towns old structures. They give a sense that generations of culture come together here, just like the rivers do. And while wishing there was enough time to rent one of the many kayaks waiting on shore, we settled for dipping our toes in the water before getting on. Entering Sarlat, I was a little bit surprised that no one was dressed up in medieval costume. Because apart from my fellow visitor’s clothing (and the restaurant menus proudly proclaiming their selection of pizza and hamburgers), there is practically nothing about the place that suggests we’re still in the 21st century. Our first stop was the local tourist office, where we quickly learned the reason for this. There are laws in place to ensure all the ancient facades in Sarlat are maintained and restored. This has completely preserved the town’s authenticity as most of the buildings are registered historical monuments. We then made a visit to the Benedictine Abbey at the heart of the town and admired how the imposing edifice blends seamlessly with its neighbouring architecture. Who knows where one building ends and the other begins? As we wander on, of course, I spot more and more signs of the modern world seeping into my dream of a time begone. But I still revel at the goods on offer at the covered market, the mansions on the Rue des Consuls, and the squares that are tucked away behind every corner. Back on the road, I feel as if I’ve just taken a little step through history. It’s difficult to picture a rainy day in the circular village of Issigeac. In fact, it’s difficult to picture Issigeac as anything but a real-life fairy tale. 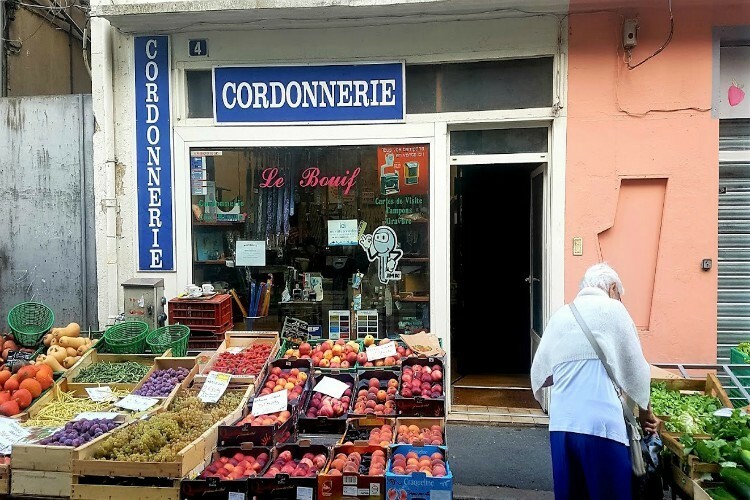 We make our stop here on a measly Wednesday, but I can imagine what a Sunday morning visit must be like when the famous local market fills the town’s narrow and winding streets. You just know that there’s no place quite like it in the world. Its medieval heritage blends into the centuries-old buildings, which locals have sporadically adorned with all sorts of greenery and art until you can’t turn a corner without encountering a pop of colour. We couldn’t resist popping into a local art shop and having a late lunch at an outdoor café (there is plenty of both to choose from). We happily soaked up Issigeac’s storybook essence with a glass of wine and marvelled at how such a place can still exist in the 21st century. As the sun rises higher and the day got warmer, we set on our way, but we would have been just as happy to cool down with a visit to the gothic church of St Felicien. We could have even continued exploring into the evening when, in the summer months, the market returns for a late-night encore. Bergerac appears just large enough to call itself a city, and that is exactly how we like it. 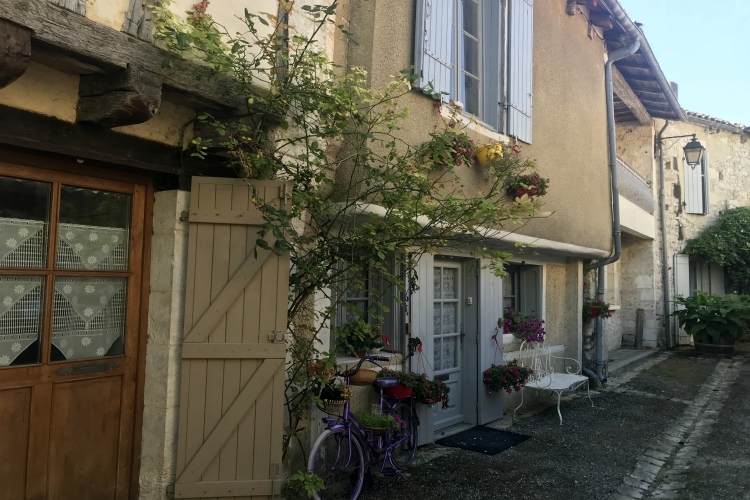 We quickly realised that we could spend days casually walking its streets and looking out on its magnificent river views over the Dordogne river. There is no doubt that the old town is the part of Bergerac we were destined to fall in love with. It is bustling with cheerful people, colourful businesses and quaint architecture ranging from medieval to renaissance. The heart of the old town is the wonderfully floral Place Pelissier (tourist office), where we returned after our explorations of picturesque nooks and crannies for a glass of wine and a baguette at one of its many cafés. As with any French village worth visiting, Bergerac is home to a weekly market that’s the true heart of local life. Twice a week, on Wednesday and Saturday, the grounds around the Eglise Notre-Dame transform into a vibrant display of local produce and deliciousness to satisfy all your hearts desires. We were lucky enough to catch it on a Wednesday morning, and even just a walk along the market route is enough to brighten your day. Even before seeing it for ourselves, we heard all bout Beynac. The locals told us that it is one of the most beautiful villages in all of France. Now that’s quite the reputation for a little village to live up to all on its own, but in retrospect, I think it did splendidly. Making our way along the river our first impression was anything but little, as we came across the imposing Chateau de Beynac. Perched on one of its high-up walkways we also took in the sight of its counterpart across the water, Chateau de Castelnaud. The two castles make quite the pair, staring each other down from opposite sides of the current. We decided to leave them to it and headed down to the village instead. Sprawling out on the riverbank with its sunrise coloured facades and shingle roofs, Beynac town is the epitome of Dordogne chic. We took photo after photo of the hidden gems found around every corner and seek shelter from the midday sun on a restaurant terrace for lunch. I struggle to put my finger on just what makes Beynac so picture perfect, but if you told me the town was designed by an artist I wouldn’t be surprised at all. We were lucky enough to have Marie-Paule, of 2bwinenot.com, show us the wonders of Monbazillac and after a wonderfully scenic drive, she took us to a decadent lunch in the quiet gardens of a local wine bar. We joked about how the village is so small, but what Monbazillac lacks in size it certainly makes up for in agreeability. It’s sophisticated and quaint, much like the eponymous drink accompanying our dessert. It’s impossible not to notice that the centrepiece of Monbazillac is its namesake renaissance castle. The Chateau de Monbazillac sits beautiful and proud on a hilltop looking out over a valley of vineyards stretching all the way to Bergerac. The view was one of the most spectacular things I laid eyes on during our whole trip. First thing’s first, the Dordogne region is famous for the colour of its stone. I can only best describe it as a mix of white and ochre (basically, very sandy tones!). But even still, it quickly became evident that the four colours of the Périgord have their unique style. In Bergerac, the timber-framed houses have a renaissance flair, yet in Sarlat, the architecture nods to the medieval times. At least to me, it was pretty spectacular to see two such stark and beguiling contrasts. The architecture that really blew me away was (typically) nestled in the rural areas. So still and serene, I would often find a cluster of gites and a Church close by – that’s the real Dordogne and I hope to always remember it this way. Despite the region’s popularity, I can’t say that I saw an overwhelming number of modern builds, and I think that’s what makes the Dordogne so unique. The houses and chateaux still retain most of their original beauty – stone spiralled staircases, sheds, shutters and tiled roofs that look like they’ve seen better days but are actually hundreds of years old. Houses aside, the Dordogne is also famed for its opulent castles (of which there are plenty). My favourite was Chateau de Beynac! This medieval fortress has plenty of incline to it (so wear sturdy shoes – unlike me who opted for sandals!). The views you get from their rocky clifftops are incredible and well worth getting a little sweaty for. Really what I’m trying to convey is that no matter where you turn, the Dordogne’s architecture is insanely special (and Instagram worthy too). The Dordogne reflects the magic of rural France to a tee; hilly countryside, old-world villages, humbled locals and a unique stillness that guarantees for a relaxing holiday. The region is a shoo-in with Brits, but don’t worry, there’s enough enchantment to go around. During our 48 hour tryst, we were lucky enough to stay in and visit some of the Périgord’s best villas and chateaux. 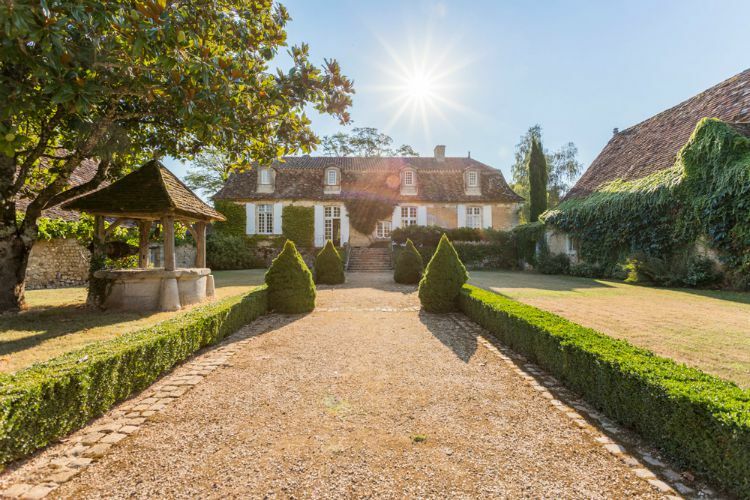 Opulent and stately, you’ll find the magnificent Chateau De Neveu tucked deep in the heart of ‘Purple Périgord (home to Bergerac, bastides and vineyards). Set in the middle of a 30-hectare estate of meadow, the chateau is an oasis of bliss. Far, far away from any noise pollution, you’ll be able to relish in the star-lit night sky as well as the perks of total privacy. The home is a delight and a labour of love by its owner Françoise – they say that homes are a reflection of their owners, and it is true in this instance. Set across two floors, every room, nook and cranny feels homely and luxurious. The stonework throughout, along with the period furniture, further adds to Chateau De Neveu’s intrigue – and that’s before setting foot outside. There you’ll find a private pool, a charming chapel (great for couples or grandparents) and a vine arbour to enjoy a morning coffee or al fresco dinner. This was our base for the 48 hours, and while you might call us biased – we truthfully couldn’t fault our stay. Le Chai is a family-owned house that’ll make you feel as though you’ve stepped back in time. The decor is just what you would expect from the region, full of antiques, pops of colour and period features that tie together so perfectly. Le Chai’s owner, Christine, is a gem when it comes to recommendations, especially as the villa’s location is close by to an array of fortified towns and wineries. After a tiresome first day touring the region, we decided to spend some time by the pool area which worked a treat at perking us up before dinner. The outside grounds are a credit to Christine’s hard work; the lawns are well groomed, with plenty of loungers and a giant chess board for kids and adults alike to play with. And if you want to keep in touch with home, you’ll be pleased to know that the wireless is pretty good and there’s also cable TV with English and US channels. “Like something out of a Jane Austen novel” best describes the beautiful Villa Sandie. Generations of family ownership have left their mark on this villa, all of which is very much present in the trinkets and artwork dotted on the walls. The attention to detail is out of this world, from the hunting lodge-style living room (bursting with family memorabilia) to the tended grounds, you just simply can’t go wrong. You’ll be pleased to know that the owners of Villa Sandie, Gonzague and Camille are just as lovely as their home. Before moving to the Dordogne, Gonzague resided in Morocco, which explains the array of exotic plants that he brought with him during the move. But even quirkier, he used to be a pilot and even though he has retired, he offers flying as an activity for their guests. 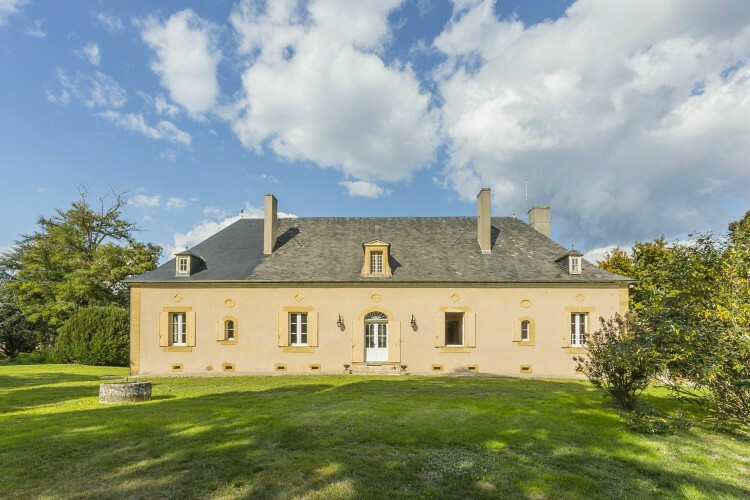 The villa sits within the commune of Liorac-sur-Louyre where you’ll find sleepy towns all around. But if you fancy getting up close to the action, Bergerac is a mere 20-minutes drive away. That’s a wrap on our 48 hours in Dordogne! Hopefully, our trip will aid your visit to this beautiful region. If you have any questions about anything we’ve written about, drop us a note in the comments below and we’ll get back to you ASAP. Or equally, if you’re keen to book a chateau or a villa in the Dordogne then please in get touch with our concierge team. Great review Natasja! A born foodie!